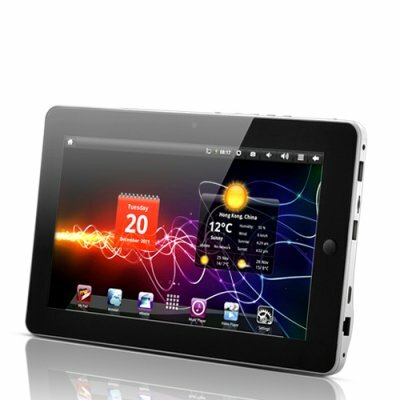 Successfully Added SuperPad - Android 2.2 Tablet with 10.1 Inch HD Touchscreen (WiFi, HDMI, 4GB, Camera) to your Shopping Cart. The SuperPad - Android 2.2 Tablet with 10.1 Inch HD Touchscreen is designed and made to impress you with its tons of features and large brilliant HD screen. Whether you read news or watch videos on the SuperPad, it’s guaranteed to bring you the most brilliant viewing experience ever. Displaying at a resolution of 1024x600 pixels, the SuperPad shows articles, photos, and news headlines clearly and beautifully. Reading on a bigger screen also means you can see more at one glance and read faster. Watching movies and playing games on the SuperPad are also a truly wonderful experience with its crystal clear display and vivid colors. The true amazing thing of using an Android Tablet is that you get access to the famous Android Market, which is home to millions of fun and useful apps, tools, games and learning materials, most of which are completely free. You can easily download your favorite games and keep yourself busy with for hours, a perfect solution to boredom and restless on the road or on the plane. Better yet, you can install the whole family of Google services like Gmail, Google Calendar, Gtalk, etc, and other apps like Skype, Facebook to keep your life organized, and stay connected with people anywhere you go! The SuperPad comes with HDMI output, front-facing camera, Bluetooth, and even GPS to help you get to your destination in time and stress-free. Connect to the internet through WiFi and enjoy fast and free internet speed. Do not have a WiFi router? No worry at all. The SuperPad comes with an Ethernet port to connect to your Ethernet cable. In a nutshell, the SuperPad comes with everything you expect from a high quality Android Tablet. With tons of cool features, the Superpad Android Tablet is the best bang for your buck today and brought to you at a factory-direct price that can't be matched. How do we do this? By cutting out the middle man and selling to you factory-direct with no markup and no extra fees! Available in our warehouse now, this 10.1 Inch SuperPad Android Tablet is ready for immediate shipment to you or your customer. Guaranteed to be the next hot item in your online store, order now before everyone has one and make a nice profit for yourself! Brought to you by Chinavasion, the leader in wholesale consumer electronics. Google Android Marketplace lets you download tons of third-party apps and games! Download your favorite apps through the Android Marketplace. Use HDMI out to connect to your television for a large screen display. Capture your favorite expressions with the front facing camera.